A properly maintained air conditioning system can help keep you comfortable on hot summer days. Did you know that a properly functioning A/C system is also instrumental in helping to defrost your windshield on those cold, damp winter days as well? A properly functioning A/C system helps to dehumidify the air passing through the defrosting system enabling your windows to quickly clear and stay fog free. If your car's air conditioning system does not seem to be operating as efficiently as it once did, let us perform a full system performance check for you. We can test the system, find the leaks, and recharge the system so you get the proper operation you deserve. 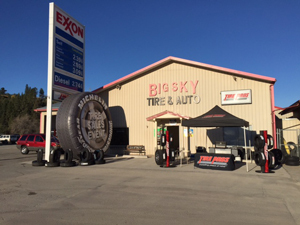 Let Big Sky Tire Pros inspect your vehicle's air conditioning today.